Reputed American Writer and Humourist Samuel Clemens, known to the world as Mark Twain was in London in May 1897 on a lecture tour. A rumour began circulating in the USA that Mark Twain was gravely ill and on the verge of death. Subsequently another rumour began spreading in the US of Mark Twain passing away in the UK. On May 28th, 1897 the editors of the “New York Journal” cabled their London Correspondent Frank Marshall White to contact the creator of Huckleberry Finn and Tom Sawyer and get Mark Twain’s reaction to reports about the author being in his deathbed in England. “Mark Twain was undecided whether to be more amused or annoyed when a Journal representative informed him today of the report in New York that he was dying in poverty in London................ The great humorist, while not perhaps very robust, is in the best of health. He said: “I can understand perfectly how the report of my illness got about, I have even heard on good authority that I was dead. James Ross Clemens, a cousin of mine, was seriously ill two or three weeks ago in London, but is well now. The report of my illness grew out of his illness. The response of Mark Twain that the report of his death was an exaggeration became quite famous over the years. The passage of time led to the original wording being somewhat embellished. Two popular versions of Mark Twain’s responses are “ The reports of my death are greatly exaggerated” and “Reports of my death are grossly exaggerated”. Both lines attributed to Mark Twain have been “greatly or grossly” quoted and cited by many in their writings. The lines about the exaggerated reports of Mark Twain’s death often come to mind in the context of Sri Lanka’s executive presidency. There have been many reports in the past that the executive presidency was going to be abolished. There have been many assurances by political leaders that the executive presidency would be done away with. There have been some attempts also in that direction. None has succeeded so far. All reports of the executive presidency being abolished have been “greatly exaggerated” so far. 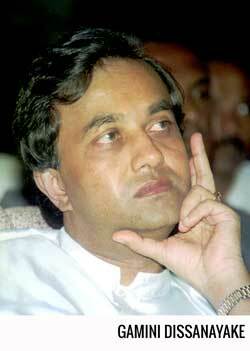 The much maligned executive presidency was established by the United National Party (UNP) Govt. of Junius Richard Jayewardene in 1978. Today in an ironic twist of fate, the UNP headed by JR’s nephew Ranil Wickremesinghe wants to abolish the very same executive presidency. Ranil Wickremesinghe first elected to Parliament in 1977 was himself part of the UNP Govt. which demolished the prevailing Westminster parliamentary system and introduced the Presidential form of Government. The Presidential system introduced by J.R. Jayewardene has a long history. When JR was Minister of State in the UNP Government of Dudley Senanayake (1965-70) he made a ground-breaking speech at the Association for the Advancement of Science. JR Jayewardene in his keynote address of December 14, 1966 outlined his vision for an executive presidency and argued in favour of a Presidential system based on the US and French models. “The executive will be chosen directly by the people and is not dependent on the legislature during its period of existence, for a specified number of years. Such an executive is a strong executive seated in power for a fixed number of years, not subject to the whims and fancies of an elected legislature; not afraid to take correct but unpopular decisions because of censure from its parliamentary party,” he said. JR’s advocacy of an executive presidency sent shock waves down the political establishment when it was made. 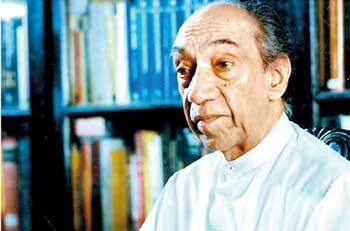 Relations between Prime Minister Dudley Senanayake and State Minister JR Jayewardene had deteriorated at that time. Dudley was firmly opposed to the idea. There were few takers for JR’s proposal even within the United National Party (UNP). In that environment JR was unable to push his proposal further but he never let go of his vision. On July 2, 1971, JR moved a resolution in the Constituent Assembly. It read as follows: “The executive power of the State shall be vested in the President of the Republic, who shall exercise it in accordance with the provisions of the Constitution. The President of the Republic shall be elected for seven years for one term only by the direct vote of every citizen over 18 years of age. The President of the Republic shall preside over the council of ministers”. JR’s motion was seconded at the Constituent Assembly by Ranasinghe Premadasa who was then the Colombo Central MP and Chief Opposition Whip. JR argued eloquently, within the Constituent Assembly, in support of an executive presidency. The motion was shot down. Constitutional Affairs Minister Dr. Colvin R de Silva led the Government onslaught against JR’s proposal. Even a majority of UNP parliamentarians were not supportive because party leader Dudley Senanayake himself was firmly opposed to the idea. The JR-Premadasa motion was rejected by the then Constituent Assembly. The UF Government brought in the new Republican Constitution on May 22, 1972. The Governor General under the Soulbury Constitution gave way to the President. As a result Power was vested in Parliament known then as the National State Assembly and while President William Gopallawa was the titular Head of State, the real power was retained by Prime Minister Sirimavo Bandaranaike. 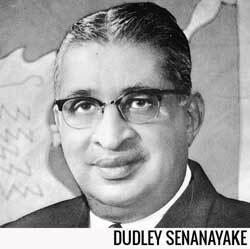 Dudley Senanayake passed away in 1973 and JR succeeded him as UNP leader. He soon established his leadership position and brought the party under his full control. JR was now able to pursue his vision of an executive presidency from a strong position. The UNP manifesto of 1977 stated, “Executive power will be vested in a President elected from time to time by the people. The Constitution will also preserve the parliamentary system we are used to and the Prime Minister will be chosen by the President from the party that commands a majority in Parliament and the ministers of the cabinet would also be elected members of Parliament.” The change to an Executive President from Prime Ministerial system was a key aspect of the UNP electoral campaign in 1977. The UNP swept the polls and obtained 141 out of the 168 parliamentary seats. JR Jayewardene became Prime Minister in July 1977. He began moving fast towards his cherished vision of an executive presidency. JR and a small group of ministers and party stalwarts (including JR’s brother HW Jayewardene Q.C.) in association with leading lawyer Mark Fernando started working towards the goal of introducing the executive presidency. The preliminary discussion was on August 7, 1977. An amendment to the Republican Constitution of 1972 was first drafted. After discussions in Cabinet it was approved and certified by the Cabinet as “urgent in the national interest”. Thereafter it was sent by the Speaker to the Constitutional Court which prevailed at that time, as an “urgent bill”. The Constitutional Court approved the bill within 24 hours as stipulated. It was then presented to the National State Assembly for debating and voting. The bill was adopted by the then National State Assembly on September 22, 1977 as the Second Amendment to the 1972 Republican constitution . Executive power was transferred to the President and JR Jayewardene became the first Executive President of Sri Lanka on Independence Day, February 4, 1978. The Parliamentary select committee was announced on November 3, 1977. Initially the chairman was JR Jayewardene who was then representing Colombo West in Parliament. JR however had to vacate Parliament as an MP in February 1978 after he was sworn in as President. 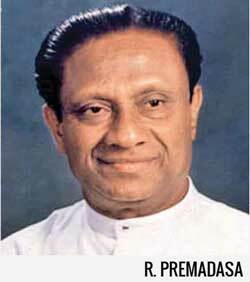 Ranasinghe Premadasa who was also serving in the select committee was then appointed chairman on February 23, 1978 by the Speaker. Mr. Premadasa was also appointed Prime Minister. Other MP’s from the UNP in the select committee were Gamini Dissanayake, Lalith Athulathmudali, Ronnie de Mel, K.W. Devanayagam and M.H.M. Naina Marikkar. Sri Lanka Freedom Party (SLFP) MPs appointed to the committee were Sirimavo Bandaranaike and Maithripala Senanayake. Ceylon Workers Congress (CWC) Leader Saumiyamoorthy Thondaman who had not joined the Government in 1977 was also on the committee. The Tamil United Liberation Front (TULF) which at the time was the main opposition party refused to serve on the committee. As a result of the left parties being wiped out in the 1977 poll, there were neither Trotskyites nor Communists in the committee. 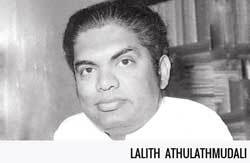 In May 1978 the two SLFP representatives withdrew from the select committee. Head of State and Govt. The executive presidency ushered in through the earlier second amendment was now streamlined and incorporated in the new draft constitution. The executive President was now Head of State and Head of Government. The electoral system was also changed from the first- pass-the post system to that of the proportional representation system. The republic of Sri Lanka became the Democratic Socialist Republic of Sri Lanka. The new Constitution referred to popularly as the “JR constitution” was formally promulgated on September 7, 1978. With the enthronement of the executive presidency , Sri Lanka’s political system changed from the British Westminster model to that of one closely resembling the French Gaullist Constitution. Power shifted to the President who was transformed from a figurehead to an effective Head of State. The post of Prime Minister was devalued in the process. The executive presidency has been in existence for nearly 40 years now. The Presidential system came in for much criticism from the time of its inception. The blame for almost everything that has gone wrong in Sri Lanka has been laid at the door of JR’s executive presidency. It became the politically correct fashion of the day to condemn the executive presidency as the root of all evil in the Island. From the time of the revolt led by Gamini Dissanayake and Lalith Athulathmudali against former President Ranasinghe Premadasa in 1991 , Sri Lankan political discourse was permeated with strident demands for the abolition of the executive presidency. The first Sinhala “talkie” film to be made was released in 1947. The title of the film was “Kadawunu Poronduwa” meaning Broken Promise. What the Sri Lankan people have been seeing for nearly 25 years is a long line of broken promises as far as the promise to abolish the executive presidency is concerned. What the country has been witnessing is the spectacle of Presidential candidates pledging to abolish the executive presidency during elections and not fulfilling their promises after being elected. Only President Sirisena and Prime Minister Wickremesinghe tried to reduce Presidential powers to some extent by way of the 19th constitutional amendment. Despite demands for its extinction the executive presidency has been enjoying a longevity in political terms. As in the case of Mark Twain’s “death” , reports of the demise of the executive presidency in Sri Lanka have been vastly exaggerated. Various Governments have come and gone. Different Presidents have come and gone. But the executive presidency goes on and on. The chief reason for this is the inability or unwillingness of political parties in general and the two main parties in particular to arrive at a consensus on abolishing the executive presidency. The executive presidency can be abolished or downsized only through a constitutional amendment or a new constitution. This requires a two-thirds majority in Parliament and endorsement by the people at a referendum. The regimes commanding a two-thirds majority in Parliament did not want to do away with the presidency. The regimes wanting to eliminate the executive presidency did not have a two-thirds majority. Where there was power there was no will. Where there was will there was no power. Hence a consensus of key political parties on abolishing the executive presidency remains as elusive as ever. This seems to be the case in the on - going attempt to enact a new constitution too. The Sirisena - Wickremesinghe Govt. converted Parliament into a Constitutional Assembly to draft a new Constitution. A 21 member steering committee was set up. The steering committee interim report was released on Sep 21st 2017. Superficially the interim report is a consensus document. However the reservations on some issues expressed by political parties have been attached to the report as”observations and comments by Members of the Steering Committee on the principles and formulations contained in the Report. These differing viewpoints indicate a divergence of opinion on key issues. This is particularly so in the case of the executive presidency abolition issue. The steering committee interim report states ; “There was general consensus that the Executive Presidency as it exists today, be abolished”. It goes on to say “The President should be conferred with powers, including those in relation to Provincial Councils in specified situations”. The report also says “ The President should be elected by Parliament for a fixed term of office”. The UNP in keeping with Premier Wickremesinghe’s directions has not made any specific observations or suggestions to the interim report. This indicates that the UNP is for the abolition of the executive presidency in its present form. It wants the current powers of the presidency to be reduced drastically and limited to specific functions only. The UNP is also supportive of the whittled down President being elected by the parliament instead of direct election by the whole country as at present. The Tamil National Alliance(TNA) has been collaborating extensively with the UNP led Govt. in the constitution making exercise. The TNA has made its distinct position known in a nine point addendum. There is no mention of the executive presidency in these. As such it must be concluded that the TNA also is of the same position as that of the UNP in relation to abolishing the executive presidency in its present form. However it must be noted that the TNA has also said it would adhere to the provisions in the interim report if the two main parties - UNP and SLFP - agreed to the same. portfolios relating to national security, the three armed forces, and Police. The fact contained in Section 10 of the draft, i.e., the concept that Parliament shall not be dissolved within the first four and a half years except on specific situations, can be agreed upon, but under what specific situations the Parliament can be dissolved during this period need to be discussed further”. “However, the Constitution shall be formulated in a manner that the concept that the country shall always be ruled by a Government of which the majority consists of representatives of the people is implemented, and the opportunity for democratically ousting a Government is given to the representatives of the people”. If this is the position of the Maithripala Sirisena led “De Jure” SLFP then the Mahinda Rajapaksa led “De Facto” SLFP or group of MP”s known as the “Joint Opposition “ (JO) can hardly be different. However the JO position on the executive presidency has been non - committal at present. In the observations made by the Steering committee JO representatives Dinesh Gunawardena and Prasanna Ranathunga to the interim report the reference to the executive presidency is “The proposed wordings presented pertaining to these matters shall be reviewed”. This indicates that the Mahinda led SLFP may keep its options open on the executive presidency issue. Currently Mahinda Rajapaksa is debarred from contesting the Presidential elections in terms of the 19th constitutional amendment. So the abolition of the executive presidency enables Mahinda to be top dog again if he becomes Prime Minister. Hence he may opt to abolish the executive presidency. However there are two factors to be taken into account. Firstly Mahinda cannot afford to deviate sharply from the line taken by Maithripala Sirisena on the executive presidency at present. Secondly there is a rising tide of support among Mahinda’s grassroots supporters for the preservation of the executive presidency. Mahinda cannot go against them. Thus both factions of the SLFP are very likely to be “united” in seeking the retention of the executive presidency. “The Westminster system as well as the mixed Presidential system existed in Sri Lanka till 1978 and 1987 respectively before the Provincial Councils were established. The issue regarding the impact the Provincial Councils have on the Sri Lankan constitution when the 13th amendment to the constitution was introduced was addressed by emphasizing the central importance of the Executive Presidency in relation to the unitary nature of the State. Therefore, it is obvious that the existence of a Presidency with a genuine power is essential for the Provincial Councils to prevail intact. Although as a party we are against the Provincial Council system, we recognize its existence since it is a part of the present Constitution. However, if the Provincial Council system exists in such a manner then it is compulsory to have a Presidency with a genuine power. If not, there is a risk of integration and the stability of the State being damaged”. United States and France respectively and all those countries are democratic in a same manner. Therefore, attempting to establish democracy by abolishing the Presidency and by creating the Parliamentary system is meaningless”. “All the things presented as grievances by the minor communities particularly by the Tamil people, surfaced not during the time the Presidential system was in effect but when the Parliamentary system was effective. “Therefore, the most logical approach regarding co-existence is that the Presidential system should prevail further. The Presidency which was created from the 1978 constitution had become non-democratic not due to an inherent defect in the Presidency, but because of the nature it was established under the constitution. That mistake was corrected to a considerable extent from the 19th amendment to the constitution. Such reforms can be done if required, Therefore, it is the view of the Jathika Hela Urumaya that a democratized Presidential system should prevail”. The JHU assertion that the executive presidency is beneficial to the minority communities of Sri Lanka does have a certain degree of validity. Political parties representing minority community interests generally favour a directly elected President in an island wide election. This is because the minorities scattered in the seven southern provinces can have a comparatively greater say in electing a President. The Tamil Progressive Alliance (TPA) leader and National Co-existence, Dialogue and Official Languages Minister Mano Ganesan told this column “We are in favour of an executive presidency that is elected directly by the people. It would provide minorities more space for political bargaining. However the Presidential powers shall be what were prescribed in the original draft of the 19th amendment. It is low powered presidency but directly elected by the people”. Four parties representing the Muslims, Up Country Tamils and Sri Lankan Tamils of Sri Lanka submitted jointly an addendum to the Interim report. The parties concerned were the Sri Lanka Muslim Congress (SLMC), the All Ceylon Makkal Congress (ACMC), the Tamil Progressive Alliance(TPA) and the Eelam Peoples Democratic Party(EPDP). According to the proposals submitted by the SLMC -ACMC -TPA-EPDP quartet the President will be the Head of State and Head of Government. The President is to be elected by the people directly at a Presidential election. The President’s term of office shall be five years and Presidential polls would be on a fixed date. The powers of the President shall be reduced to the levels originally envisaged in the 19th Constitutional amendment and be made answerable to parliament. The President would be the minister of defence and not hold any other cabinet portfolio. The four parties also want three vice-Presidents from different communities to be appointed. The three vice-Presidents will be from ethnic communities different to that of the community to which the President belongs. Since the chances of a Sinhalese not being elected President are quite remote the three vice -Presidents will be from the Sri Lankan Tamils, the Muslims and the “Malaiahath Thamilar”(Up Country Tamils). The Sri Lankan left or what is left of the left too is somewhat aligned on the question of the executive presidency. The JVP wants the executive presidency abolished The Janatha Vimukthi Peramuna (JVP) in its addendum says “ The Executive Presidency shall be completely abolished. However an Executive Prime Minister shall not be created in lieu of the position of the Executive President”. Dr. Jayampathy Wickramaratne who could be described as a co-architect of the steering committee interim report has also submitted an addendum. In the addendum Wickramaratne says “ I wish to add my own comments on the matters covered by the Interim Report. The views expressed herein are also the views of the United Left Front and the Lanka Sama Samaja Party (Majority Group), He then goes on to express his views on the executive presidency. Dr. Wickramaratne then outlines his position “I am for the abolition of the Executive Presidential system of Government. The President should be elected by an Electoral College consisting of Members of Parliament and the Second Chamber. While the President should ordinarily act on the advice of the Prime Minister, I have no objection to the President exercising certain powers after consulting the Prime Minister”. These then are the differing viewpoints of different political parties on the executive presidency. Judging by the depth and breadth of these differences one wonders whether any sort of consensus could be achieved on the future of the Presidential system of governance. Interestingly enough we have a peculiar and seemingly paradoxical situation where the UNP which introduced the executive presidency wanting to abolish it and the SLFP which opposed it vigorously for years now wanting to retain it. Against that backdrop one cannot but help wonder whether JR Jayewardene’s executive presidency will ever be abolished at all.